3D Infotech's Point2CAD from 3D Infotech on Vimeo. Sketch Cone function - Cones are created by extruding a circle with the appropriate draft angle. All done within one tool. Sketch Sphere function - Spheres are created by revolving a circle. Saves the user the extra step of going back to the computer to use the revolve tool. 3D Pipe creation - Quickly create a pipe or tube by sweeping a circle or ring along a path. Creation of multiple planes at once - Specify any number of reference planes to be created at a uniform step between any two existing reference planes. 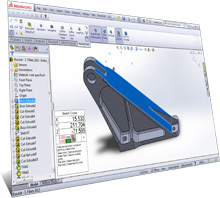 Separate functions for extruding boss, cut and surface - The user can now specify which operation to perform. New Command Plate - Rearranged and extended. Direct 'Print Command Plate' function - Print command plate button added to the Point2CAD ribbon. Precitrack3D Preci 3D Track optical tracker - Now supported in Point2CAD 2.3. 6DOF Systems Karbon optical tracker - Now supported in Point2CAD 2.3. You have purchased license after Sep 28. 2015. Just download the 2.3 installer, install the application and update the license in Point2CAD. You have purchased license before Sep 28. 2015 and your one-year of Maintenance & Support period is over. Please contact your reseller for more information.